The Tokyo bar is a circle, Teppanyaki hotel chefs in tall hats and shirtsleeves in the centre; their shiny cleavers deftly dealing with slabs of beef, cabbage, prawns and abalone.The air smells of garlic and warm vegetable oil. I sip a Sapporo, the man across the way more intent on his mobile; beside him a woman with a floral print iPad. There’s the click and chop of finally-honed steel and the man’s fitful coughs, both diners oblivious to the chefs’ theatrics. Neither touch their food. The man’s around 40, in a heavy winter coat and woollen beanie despite the heating, the woman older. The next morning I’m at breakfast finishing coffee, when there’s a weak voice from the next table. I’ve been immersed in my paper and a world full of troubles. Initially I don’t notice the man from the bar last night, although he’s again overdressed with scarf and gloves. The voice is American-English. “You are in Tokyo for business?” he asks, and waits for me to answer. I lay the newspaper on the corner of the table and shake my head. I’m here to see the snow monkeys, 2hrs north of here. After a time there’s a deep breath, a cough, raised eyebrow and finally a smile. “I will see you there.” His voice lacks conviction.”The world is small, is it not?” He stares out the hotel window to the coiffured garden. Smokers stand on a red bridge above the waterfall. I push my empty coffee cup to the side, and fiddle with the paper. His skin is grey, the occasional cough more retching than the night before. There’s a rash on his neck, and his lower face riddled with acne. He makes a move to stand and I offer him my newspaper. He shakes his head. “To be honest, I have no interest in news of the world. We must wish for good weather you and I…a long life, and many monkeys. But I am sorry…I keep you too long. You have a bullet train today.” There’s a bow as he rises from his table, unleashing another bout if coughing. From the subway, it’s a walk to meet my girlfriend at Central Station, the Shinkansen leaving right on time. The mauve cone of Fuji flashes past, away to the west, framed by Tokyo towers of steel, concrete and glass. From Nagano it’s a local train, across orchard flats, then through rolling hills covered in a metre of snow, the bones of plum, cherry and apple orchards. Our Yudanaka hotel is 5min walk. We book in and leave our bags, the path from the station slippery sludge, surrounding roofs shrouded in thick layers of white. 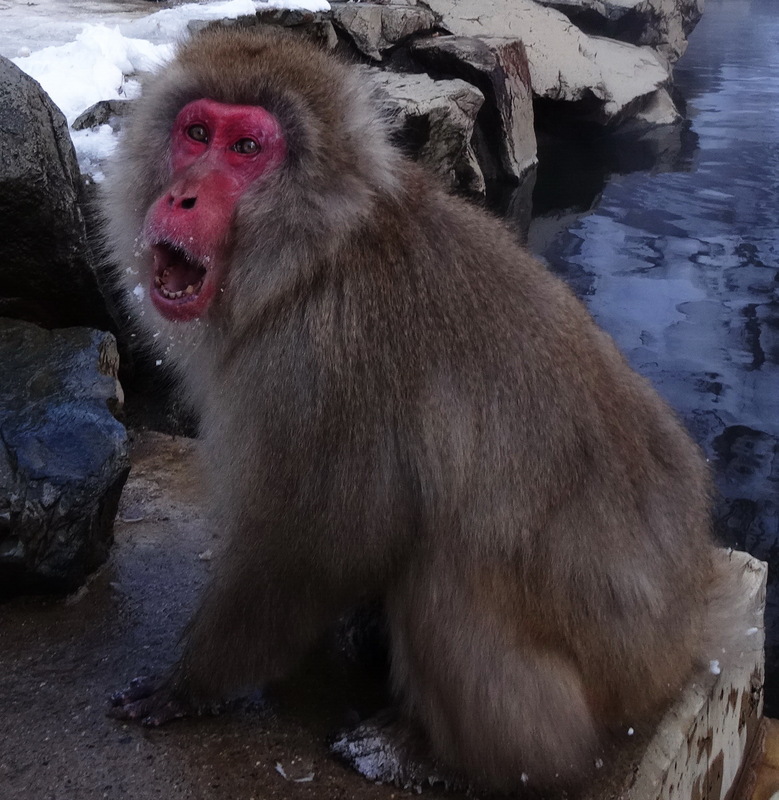 It’s a 20min taxi to Jigokudani Yaen-Koen – or Hell’s Valley – the home of 400 macaque snow monkeys that bathe in the hot springs. The 30min path to the steaming springs is steep in parts, winding through a bare, brooding forest, the stone steps steep, the path ice and frozen mud. It’s -4degC and I wonder how my Tokyo friend will cope tomorrow. It’s 2hrs before we drag ourselves away from the bathing monkeys, the extended families, mothers and babies. That night we drink champagne and laze in an steaming rooftop spa, moonshine aglow on high-pitched roofs. Rolling hills are blue, the ring of mountains black; scattered town lights no match for the endless canopy of stars. Later we dine downstairs, behind paper sliding walls, served by a shuffling woman with a white face, her red kimono a print of camellias and dragons. There’s thimble glasses of apple liquor, boiled burdock, littleneck clams and the sweetest Shinshu salmon. A juicy fillet of grilled Shinsyu beef sizzles on a hot stone, along with a dollop of bubbling butter; the wine a local bottle of Hayashi red. In the morning we sleep late, share a private breakfast, browse the hotel gift shop for bags of jellied cherries and caramelised chestnuts. I hear the phone from reception next door; the answer in Japanese, the hotel owner curt. At the front door he catches my eye and shakes his head. It seems a couple have cancelled late, the woman apologetic.I look over to my girlfriend. Could it be my Tokyo friend? Outside, icicles hang from hotel fascias and we trudge through powder snow past the deserted station. The centre of town is silent too, wet sidewalks slippery. A man with steaming breath, great lumberjack coat, fur cap and ear muffs, swings a shovel to clear his car. My girlfriend’s nose has a tinge of blue. The road risers by empty hotels, backpackers’ digs, quaint Japanese inns and chalets, a wide, white valley away to the west. From valley’s edge our goal lay further up the hill – Heiwa no oka Park, the snow deeper and deeper. The head of the Goddess of Mercy appears suddenly, above the surrounding bones of apple trees and taller outstretched boughs of maple and oak. Covered steps lead upwards from the icy road. She stands 25m high with a tiara and lengthened ear lobes – on a 3m high podium – left hand raised, the right down by her side. The snow is up to my thighs, a giant bell and temple off to the side. I wonder at the ways of fate, and that enigmatic smile. In WW2, with Japan in turmoil, the bronze Goddess – or ‘Kannon’ – is cut up and shipped to be scrapped and melted for weapons, part of a last ditch war effort; only saved by the obliteration of Hiroshima and Nagasaki. Japan immediately surrenders in 1945, the Goddess returned and reassembled. With the return of the Goddess – now the `Goddess of World Peace’ – the park’s trio of famous deities are reunited: the Goddess offering the visitor a peaceful life; ‘Miroku’ the protector from earthquakes; and the ‘Tobacco Deity for prolonging life’. In olden days, this was a bustling red light district, each deity visited by prostitutes and locals; cigarettes and flowers offered instead of joss sticks. Later came visitors from the wider area: regular smokers wishing for good health, and those asking for help to quit the habit. Soon, visitors prayed to be protected from cancer, leaving offerings of burning cigarettes. My girlfriend leaves 100yen and tolls the bell – a deep ring resounding down the valley – our aim to visit all 3-deities, thereby ensuring our wishes come true. The Tobacco Deity is last, a small stone statue at the bottom of the hill, in a small gable shed open at the front. Small jars hold fading sprigs of mountain flowers. Your skill of making me feel the sensations of the characters is remarkable. I love the symbolism. The Goddess seen as just parts rather than the sum of her parts. Society reduces us to tools, just cogs in a machine. Our humanity does not dig ditches, build power lines, design new cars, so it is useless to society. It is more profitable to break our humanity down into pieces that can be useful. We are just janitors, just dentists, nothing more than a pair of arms digging, cleaning, sweating. Society breaks us down for parts and reassembles us later as consumers in the image of advertising culture. Thank you so much Kyle. & your visit here is appreciated. Interesting how the Tobacco Deity is symbolic of prolonged life. The overdressed long-time smoker in the bar is symbolic of how society kills individuals without lifting a hand, through its mores equating success and prosperity with money and hard work, instead of personal contentment and happiness. 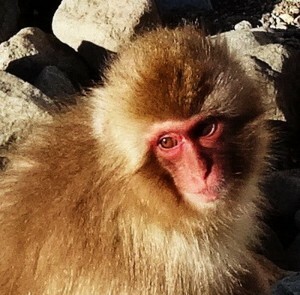 The snow monkeys sounds like fascinating creatures. And your descriptions of food and wine made me hungry!!! Interesting indeed Kris, with a dash of savage irony. Ian, always a pleasure to read your stunning narratives so rich in vivid and concrete detail. You capture as well as anyone I’ve read the impermanence and contingency of our human presence in this world. You seem to be an explorer hunting out the faint traces of the past that our cultures and civilizations have left behind. The journey is ongoing for us all. There are several threads woven in that compelling piece, some apparent and some as an undercurrent. Apart from the obvious sensory treat, tactile, visual and olfactory, there is that sense of something lurking just ahead in the air, culminating in the cancellation of the booking at the hotel over the phone. I have always relished the powerful vignettes tucked in casually in your narrative. The story of the dismembered and reassembled goddess is an interesting closing shot. Life is indeed the sum of many parts.